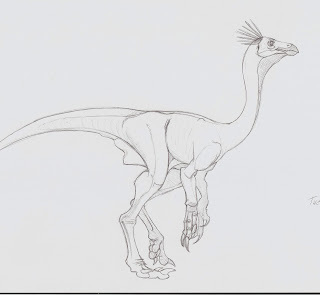 Here's an unusually short-bodied ornithomimosaur that I drew last night while Scott, Raven, and I all lambasted a certain egomaniacal paleoartist and had a good laugh while doing so. I think the Lanzendorf committee should name a certain egomaniacal paleoartist its sole chairperson... thus saving the expense of having to name winners, because no one would be good enough. I knew it! You're all against me because of my superior reconstruction skills! They laughed, they laughed when I said trilobites had bat and dragonfly wings, but who's laughing now? Huh? You owe me a dollar for that drawing. It's facing the same direction and has a foot on the ground, same as my piece of genius here.